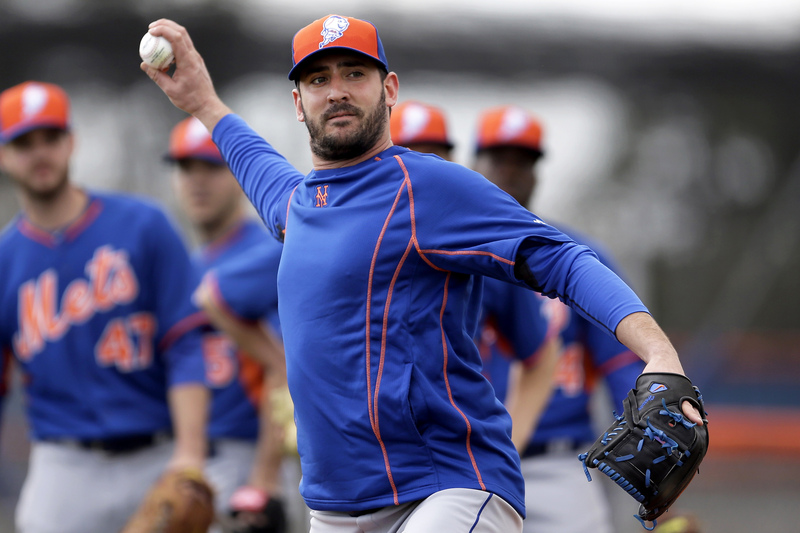 Everybody in Mets world knows about the imminent return of Matt Harvey. In fact, he’s progressing very nicely and is scheduled to face hitters for the first time on Thursday. Sandy Alderson said that Harvey’s workload this spring will be 90-95% of what it would be on any other year and he has not ruled out Harvey pitching 200 innings this year. But Harvey is not the only Mets pitcher to be coming back from Tommy John surgery. Closer Bobby Parnell also went under the knife after getting injured on Opening Day of 2014. He is expected to make his return by the end of April, giving the Mets a potentially dominant bullpen with the ability to strike out the world. Harvey and Parnell, two hard throwing pitchers in positions of maximum importance (ace and closer), are ready to help pitch the Mets back into contention. With the return of Harvey as mentioned above, the Mets are faced with a unique problem: too many starting pitchers. With Harvey as the headliner, the Mets have six quality starters (Harvey, Zack Wheeler, Jacob deGrom, Bartolo Colon, Jon Niese and Dillon Gee) as well as at least two more waiting in the wings in Noah Syndergaard and Stephen Matz. As a result of this, Gee appears to be headed to the bullpen. This will require an adjustment for the 28-year-old Gee, who has served as a starter for his entire career. It is likely he will serve as a long reliever, so that the Mets can keep him stretched out for when Harvey needs to skip an outing to rest his elbow (or barring any injury to another starter). That said, he will need to be ready to be called upon at a moment’s notice and his adjustment to life in the ‘pen will be noteworthy. Some people may be surprised I made it this far without mentioning the biggest hole in the lineup in the Mets lineup. Wilmer Flores is currently penciled in as the starter with Ruben Tejada to be the backup. While the situation is extremely likely, neither of these assumptions is set in stone. The team has said that prospect Matt Reynolds will see a good deal of time at shortstop during Spring Training. While Reynolds may not be ready this season (he spent only half a year in Triple-A), the team may feel much more comfortable with the position going forward if he impresses them in spring training. He won’t be starting on Opening Day but Tejada may find himself looking over his shoulder at Reynolds. This is a weird one. Eric Campbell served as a utility infielder/outfielder/bench player for the Mets last season after Josh Satin couldn’t get the job done. 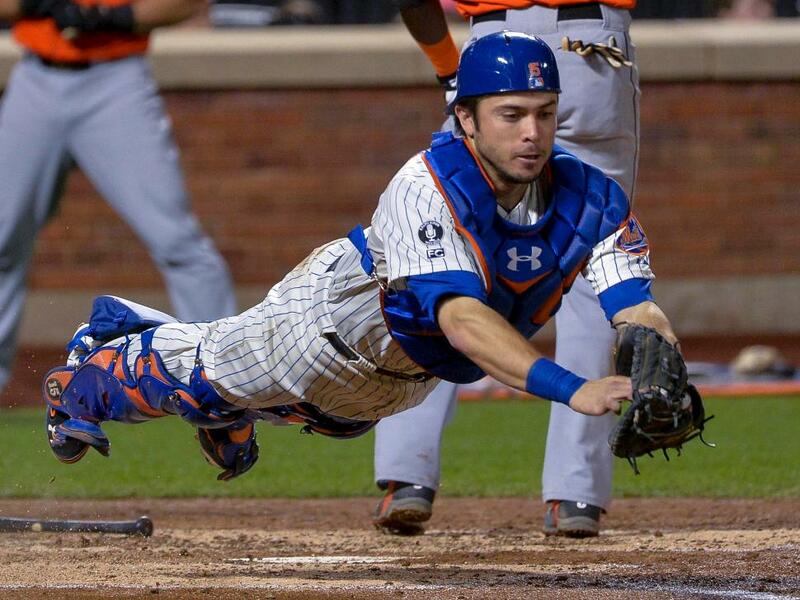 He reported to Port St. Lucie this spring with the intention of adding catcher to his increasing positional repertoire. At this point, it isn’t clear whether or not this is for the sole purpose of fulfilling the role of “emergency catcher” or if Campbell is using this to earn more playing time as a potentially regular backup to Travis d’Arnaud. If he does opt to make the positional change more serious, he could open a roster spot for another player. If Campbell serves as backup to d’Arnaud and utility defender, the Mets would not need Anthony Recker and instead could opt to carry a player like Dilson Herrera or Matt den Dekker, who each earned a cup of coffee with the Mets in 2014, but will likely will be left off the Opening Day roster in 2015. The Mets have expressed interest in trying to carry a second left-handed reliever to complement Josh Edgin. However, with Gee in the bullpen and Parnell returning, they are somewhat short on space. That said, I’m going to give the benefit of the doubt to Terry Collins and Sandy Alderson and believe that they find a way to bring two lefties to D.C. for Opening Day. The leading candidate is Sean Gilmartin, the team’s Rule-5 draft pick this offseason. I give him the edge primarily because of his Rule-5 status, which dictates that if he is not on the active roster, he is sent back to the team the Mets took him from. Additionally, he does have experience as a starter, indicating that he can be more than just a simple lefty specialist. Also competing for this job will be Dario Alvarez, who was promoted towards the end of last season but saw only limited time, Jack Leathersich, a prospect who also attended Spring Training last season and Scott Rice, lefty specialist from 2013, who suffered an injury last season in the minors following his demotion. Rice has the most major league experience of the four but there are questions regarding his health and effectiveness. There you have it. Five important things to watch as the Mets begin the first official workouts of Spring Training 2015. Each will be key for a team that hopes to return to relevance and competitiveness this year. Only time will tell whether the current pieces are enough. Fight through the cold Mets fans, only 42 days until baseball is back. According to Ken Rosenthal of FOX Sports, free agent starting pitcher Jon Lester has narrowed down his potential destinations to either the San Francisco Giants or Chicago Cubs. A decision is expected to be made no later than Tuesday. Lester would instantly join the top of the rotation for either team, but he’d especially be a significant upgrade in the Windy City. The Cubs currently lack a true ace, so Lester would need to carry Chicago’s young pitching staff. In San Francisco, Lester would most likely slide into the #2 spot in the rotation, behind reigning World Series MVP and 2014 Sports Illustrated Sportsman of the Year Madison Bumgarner. It wouldn’t be a far move for him, either, as he played across the bay in Oakland for the second half of last season. 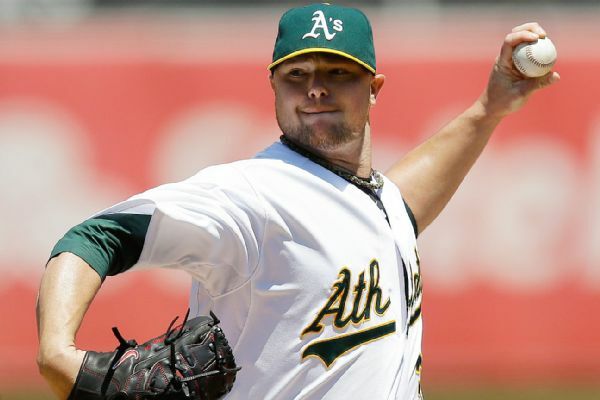 Between Boston and Oakland in 2014, Lester compiled a 16-11 record with a very formidable 2.46 earned run average. He was the starting pitcher in Oakland’s eventual loss to Kansas City in the AL Wild Card game, and received a no decision despite allowing 6 earned runs in 7.1 innings. Lester’s contract will be one of the more expensive ones of this free agent class. According to several reports, a contract seems to be in the range of $140 million for 6 years, although those in Lester’s camp are quietly pushing for a deal in the $150 million / 7 year range (via MLB Trade Rumors). The Red Sox broke the bank on Monday when multiple news outlets reported that the team came to terms with shortstop Hanley Ramirez on a four-year, $88 million deal with a fifth year option for an additional $22 million. Ramirez now heads back to the team that drafted him, before Boston traded him and four other players to the Marlins for a three player package highlighted by pitcher Josh Beckett. 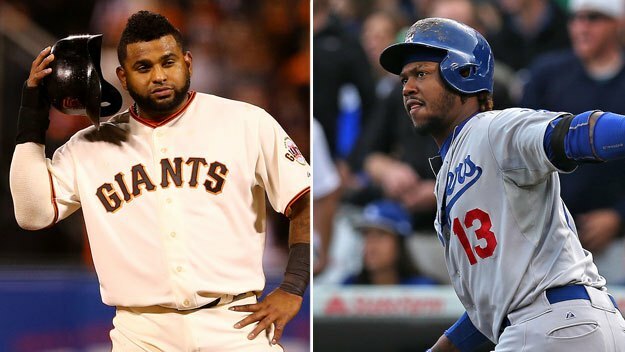 Earlier in the offseason, it was reported that the 30-year-old Ramirez would be the Red Sox’s backup plan, had they failed to sign third baseman Pablo Sandoval. However, Monday afternoon brought an important announcement from Sandoval’s agent. 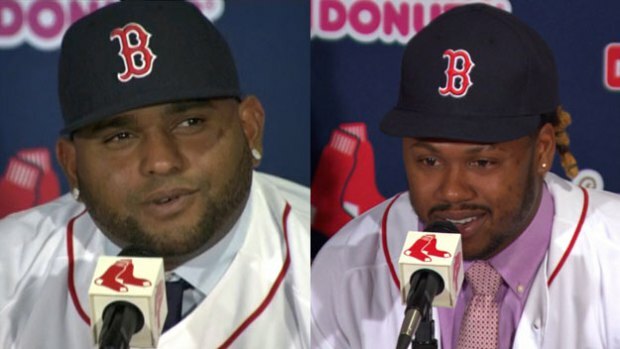 The man they call the Kung Fu Panda is expected to ink a deal with the Red Sox worth at least $90 million over five years. Sandoval’s agent informed the San Francisco Giants that the switch hitting slugger had chosen to play for Boston. Sandoval was believed to have been choosing between San Francisco, Boston, and the San Diego Padres. Ramirez isn’t expected to play shortstop for Boston due to the presence of the 22-year-old Xander Bogaerts. The Red Sox wouldn’t replace Bogaerts, would they? It would be more likely to see Sandoval at third and Ramirez in the outfield. With six other potential outfielders, the signing could lead to the Red Sox dealing one of their current outfielders in a trade. Many will speculate that the odd man out will be the recently acquired outfielder Yoenis Cespedes, simply because of his value. Cespedes will be a free agent at the end of the 2015 season, so he seems like a likely candidate. At the end of the day, the Red Sox improved and that’s what matters most to the fans of Boston. They’re sure to make some noise this season. Was put up on Twitter during the seventh inning by Dabuzzza founder Brett Malamud. 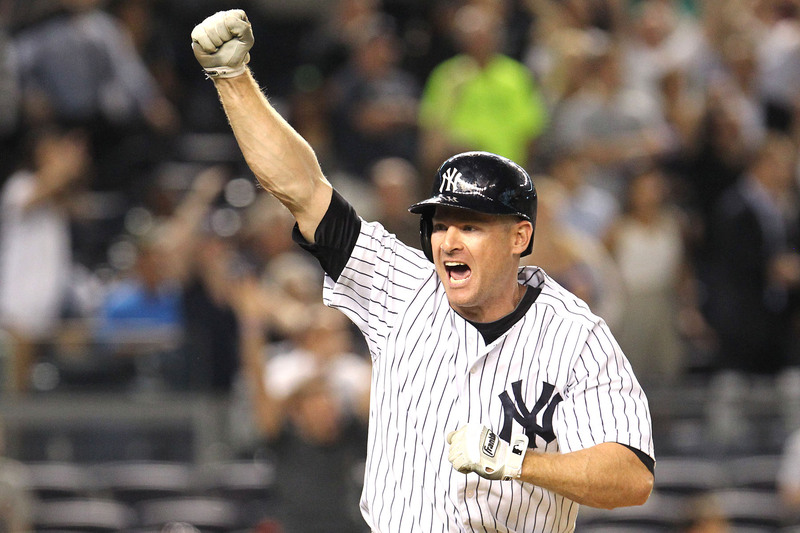 Jeter hit a walkoff in the ninth.